EAT. LEARN. NETWORK. 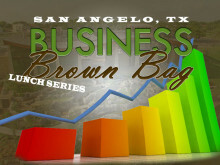 Don’t miss this FREE monthly noontime “bring your own brown bag” business focused speaker series. Please call the Chamber to register at (325) 655-4136.